If so, I wonder if they'd make it more naff, so it could appeal to those afraid of inversions, or less naff, so it can compete in the league of the "big thrills" at Magic Mountain. As presented, what could have been a high-end family coaster is instead a vastly overshadowed thrill coaster. What's the point of building a white-knuckle ride if it's less white-knuckle than half a dozen coasters you've already got at the same park? To be honest, as much as I'd prefer the latter, I'd settle for either. Or just build a ride that doesn't disappoint everyone short of a small segment of your target demographic. Looks like I won't be getting this cred in June. And yall said Maxx Force would be the one to get delayed. Zek_Teh_Kek and Pear like this. This is Six Flags we're talking about. Neither will open on time. Slap bet Maxx Force opens on time. I have faith in my park. Yeah you can never expect a new attraction at SFMM to open on time. July 1 is really the earliest I'd ever plan on going to a SF park with a new addition. This new concept art from WCC of the blue train on WCR has eliminated comfort collars from the design. Could this mean the coaster will only have a lap bar? Benenen and Matt N like this. This new concept art from WCC of the blue train on WCR has eliminated comfort colours from the design. Could this mean the coaster will only have a lap bar? 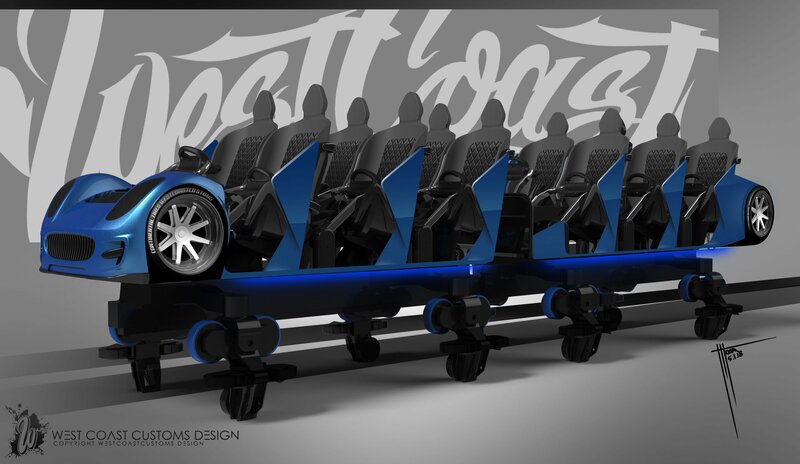 Regardless of what lap bar system this ride will utilize...have they even broken ground yet? They've closed off a significantly large section of the park for months now and don't seem to be doing anything. That's a really odd move to make for a business unless there's a damn good reason for it. I notice a subtle edit on his post from 2 minutes after your own I actually quite like the train design for this tbh, whether or not the experience will be any good is another thing I guess. I know Six Flags Magic Mountain is notorious for opening projects late, but this is laughably horrendous. There isn't a single footer visible in that photo. The park closed down this corner months ago and they have dirt to show for all the effort they've done thus far. @tomahawk and I had a bit of a chat earlier with regard to why - he'd bet that the delays have to do with the housing development that's about to start behind Apocalypse. Not sure why a new coaster would cause problems when Apocalypse already borders the neighborhood, but whatever. Maybe they've found some old arrowheads or pottery or other historical artifacts? It's a bit of a nuisance when digging in urban areas in Europe, but less common in the US - and therefore presumably an even bigger deal when they do find something. Matt N and oriolat2 like this. mrrc, toofpikk, Jaiden M. and 8 others like this.